Restaurant Kappeli – “the pearl of Espa” – was opened to the public 1867 as summer restaurant but since 1970’s it has been open all year round. Latest renowation was in autumn 2011 still keeping same traditions in building structure. In the summer one can also dine at the outside terrace which is at the end of the building behind main terrace. 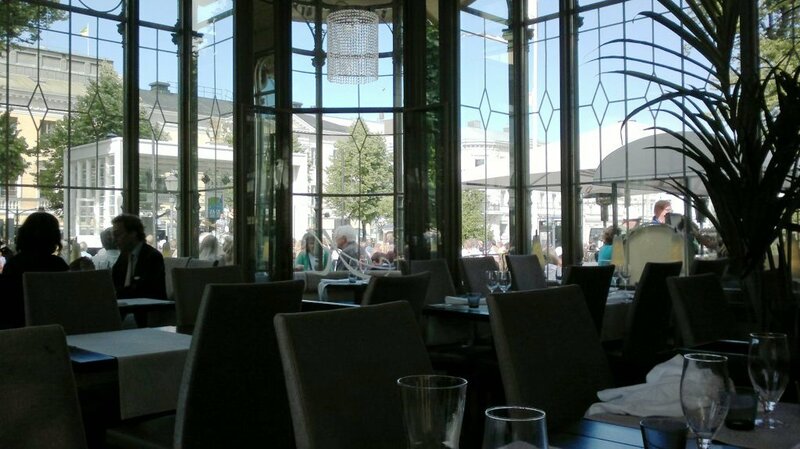 If one wants to sit in the middle of the main terrace but inside, ask for oriel window table for two. It is small but charming and one can even watch bands and singers on stage opposite the restaurant. 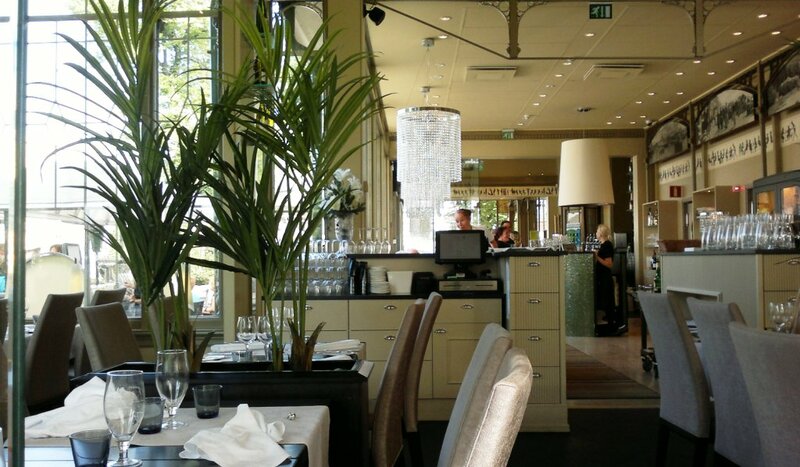 A la carte consists of menus honoring famous Finnish artists or writers like Eino Leino, Sibelius and Juhani Aho. 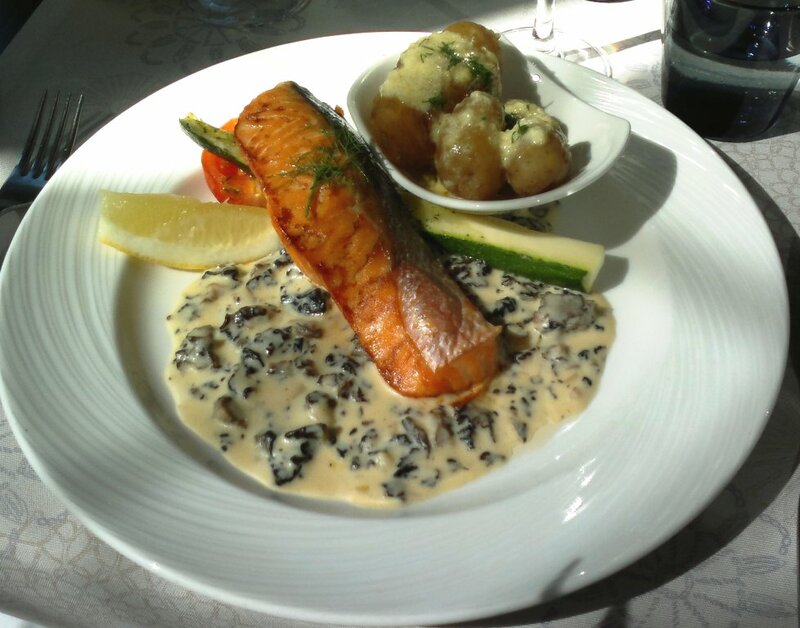 It also includes Finnish traditional fish and meat dishes. Wine list is artless and expensive which provides opportunity for the restaurant to improve it. Service needs some experience, forgot to serve us bread and no towel or cloth for Prosecco bottle. For starters ordered Kappeli’s fish assortment – smoked salmon mousse, cold smoked Baltic herring skagen, smoked whitebait, cold smoked salmon and scrambled eggs and Caesar salad and chicken. 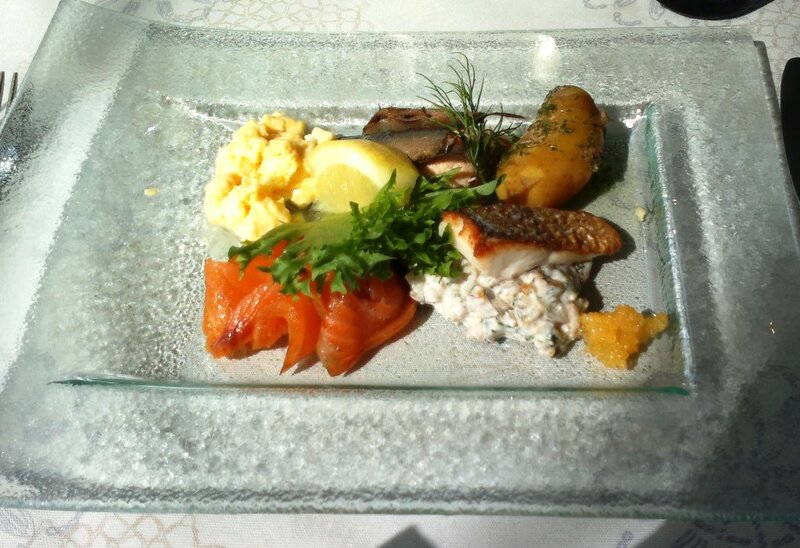 Fish assortment was diverse but skagen was too salty.Wonder also why scrambled eggs were included? 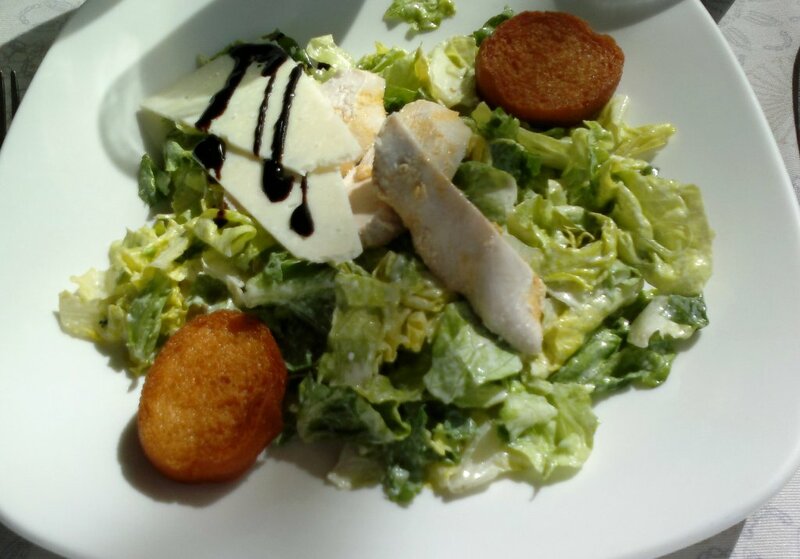 Caesar salad was as it should be. Even the chicken was much better than last year, without skin and fresh. Great improvement! 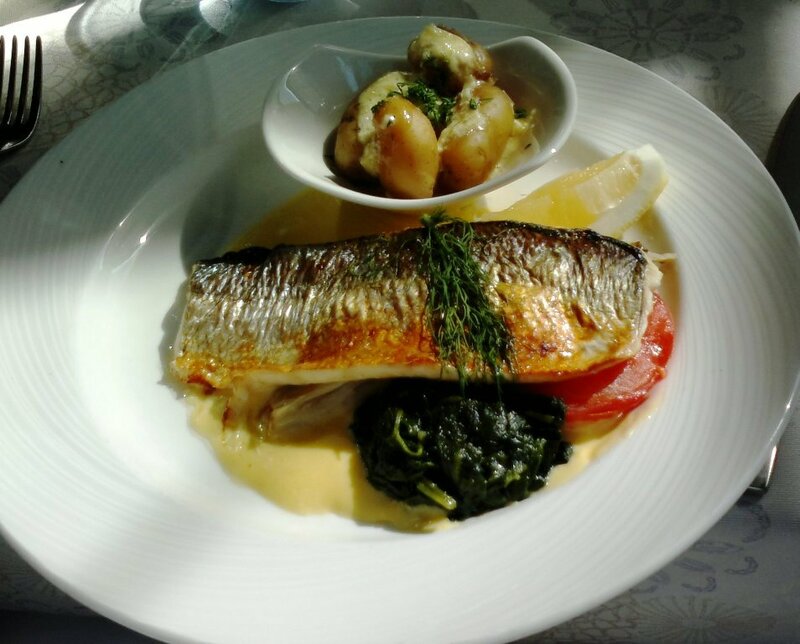 For main courses had Grilled whitefish with spinach, Hollandaise sauce, potatoes with dill, butter and onion and Smoked salmon with creamy false morel sauce, potatoes with dill, butter and onion, baked tomato and zucchini. Whitefish was a little bit over grilled but potatoes in their butter onion sauce were excellent in both portions. Salmon was also a little bit too much smoked. Good achievement was that both portions were warm, almost hot. In the summer the terrace of Kappeli is always crowded. Most of the diners inside were tourists; heard Spanish and German in nearby tables. Because of historical building and athmosphere Kappeli earns 4 as an overall grade.